Additional Info: Hello - My name is Myrna Michel and I am due to return to the UK around September 2019, having lived and worked in New Zealand since 2014. Please message me ahead of time if you are planning ahead. I am a vocal teacher, coach, accompanist with 50 years' experience of working with singers, for recitals; examinations; auditions. MA and BA (Hons) in music. 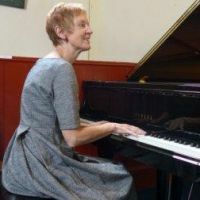 I have been house-pianist for masterclasses led by international tutors; adjudicator; song-writer; composer for theatre; workshop leader; concert-curator; choir-leader and opera conductor. My style is flexible and supportive. In studio, I am able to coach singers in the pronunciation and understanding of seven European languages. I teach adults only, not children unless it is to raise a child's personal confidence. Therefore, I do not coach pop-singing.